SAN DIEGO — Brandon McCarthy was never better than Friday, and his timing was just as good. As trade July 31 deadline looms, McCarthy understands the reality of his situation very clearly. 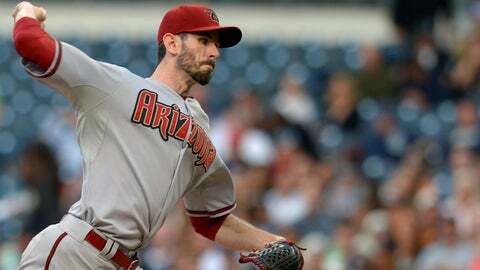 The Diamondbacks are an unlikely contender on the brink of changes, and he is in the last year of his contract. McCarthy’s dominant performance in a 2-1 victory over San Diego at Petco Park not only brought the D-backs within one game of escaping last place in the NL West but also added some luster to a season that has been a career outlier. He has won both his starts here but is 0-10 elsewhere. "It certainly seems likely," McCarthy said of a possible trade, "but if I am still here at the end of September, then great. It is a place I enjoy. "At this point, you become an asset the other way. Right now as a Diamondback, sometimes your best value is your future value and what they can get for you. I totally understand that side of the game. You accept it as reality, but it is not something I sit and worry about all the time, check every rumor. Just let it happen, and when I get a phone call and that happens, there you go." McCarthy pitched from ahead in his seven innings, throwing first-pitch strikes to 23 of the 26 batters he faced. He struck out seven and did not walk a batter, getting to three-ball counts only twice, both to Chase Headley. "Mac was in control all night," D-backs manager Kirk Gibson said. "It was a good job by him. He is capable of doing that more consistently." It was the kind of performance that earned McCarthy a two-year, $15.5 million free agent contract in the winter of 2012 after a combined 17 victories and a 3.29 ERA in the previous two seasons with Oakland. He was 5-11 last year. "Baseball players have an internal clock and they understand how these things work and they know when things are lining up to happen," McCarthy said. "So you understand (a trade) is a possibility. It’s not a panic situation. It if happens, you can pick up and go and resume elsewhere." Even against a stacked lineup that featured four left-handed hitters and three switch-hitters, McCarthy did not give up anything stronger than a single. Opposing pitcher Tyson Ross followed two of those singles with a sacrifice fly in fifth fifth, but it was not enough to offset David Peralta’s two-run single in the fourth. "I threw a lot of strikes, which was good," McCarthy said. "I know they are scuffling a little bit … anytime you have a situation like that, you want to jump at it as much as you can and not give them room to breathe. I felt we did a good job of that and putting them away at the end." McCarthy’s other victory this season was a 4-3 decision over the Padres here May 3, when he gave up three hits and a walk in seven scoreless innings before the bullpen managed to hold on. He had given up five runs in four of his last six outings, usually as the result of just one inning that got away. "It’s good to have a positive result. It didn’t feel all that different from some of the ones that have gone bad. Me and ‘Miggy’ got on the same page early. We were able to stay ahead of the hitters a little bit and ride that through," McCarthy said. Montero said one of McCarthy’s keys was his ability to throw his off-speed pitches for strikes. He retired the last batter he faced, Alexi Amarista, on an 81 mph curve ball. "His secondary stuff was good, and we used a lot of it. More than normal, and that made his fastball look better," Montero said. "Curve ball in and out, and obviously he located his fastball pretty well, too." Montero chipped in on defense, too. With a runner on third base and one out in the sixth, Montero took a throw from second baseman Aaron Hill to get Chase Headley in a rundown between home and third. Montero threw to Martin Prado, who tagged out Headley and threw quickly to second base to get Venable to complete a double play. "That was a huge play." 23 — first-pitch strikes by McCarthy to the 26 batters he faced. * Shortstop Chris Owings was scratched from the lineup with the same right shoulder soreness that forced him to miss three starts last week. Didi Gregorius started in his place. * Addison Reed struck out two in a 1-2-3 ninth inning for his 18th save. He got Chase Headley swinging on a slider and Will Venable swinging on a fastball to end the game. Reed threw his slider for strikes, which made his fastball livelier. * Waivers on J.J. Putz expire Saturday, General Manager Kevin Towers said, at which point Putz will be free to negotiate with any team. If Putz clears waivers, the D-backs will be obligated to pay the final $3.6 million on Putz’s salary this season. A team that takes him on will pay a prorated portion of the major league minimum salary, $500,000, which now is right at $250,000. * Nick Evans was purchased from Triple-A Reno on Friday to balance the roster at 13 position players and 12 pitchers. With Eric Chavez and Mark Trumbo on the disabled list, he is the only one other than Paul Goldschmidt who can play first base. Evans replaced Zeke Spruill, who was optioned Thursday. San Diego left-hander Alex Torres is the first pitcher to embrace the protective, padded cap designed to lessen the impact of a ball to the head. Torres wore it Friday, when he struck out Montero with two on and two outs to get out of the eighth inning. Torres has only worn the cap in San Diego and San Francisco this season. McCarthy, struck in the head by a line drive two seasons ago, likes the idea but believes more work on material needs to be done. Torres has only worn the cap in San Diego and San Francisco this season, where temperatures can be in the 60s. "A St. Louis day game, I don’t know how that would work," McCarthy said. "The whole reason I am not wearing it is because of the heat issue. Until that is overcome, it’s tough to wear it."